After months of speculation it now appears that Nine‘s Jana Wendt is to move to New York to appear on the US version of 60 Minutes. Her contract with Nine expires at the end of the year — and through Nine’s output arrangements with the US it will still have access to Wendt’s US 60 Minutes stories, but without the high salary. Wendt’s husband Brendan Ward is also free to move with no professional ties here except for some post-production work for Seven. The stars of some of Australia’s most popular TV dramas of yesteryear will battle it out in Sale Of The Century‘s Battle Of The TV Classics. Joining Glenn Ridge and Nicky Buckley will be Paul Cronin, Lorraine Bayly, Andrew McFarlane and Susan Hannaford from The Sullivans; Maggie Kirkpatrick, Val Lehman, Fiona Spence and Colette Mann from Prisoner; Cornelia Frances, Chris King, Bartholomew John and Judy McBurney from The Young Doctors; and Jeff Kevin, Johnny Lockwood, Candy Raymond and Elaine Lee (pictured) from Number 96. Following the ratings success of the recent tribute to The Don Lane Show, the Nine Network is doing it again this week with The Don Lane Show, Too! “There’s interviews that even I’d forgotten I’d done,” Lane told TV Week. But while TV variety is becoming a thing of the past, Lane is set for the next stage in his TV career. He has signed a lucrative deal to host a home shopping show for a pay TV network. “I see this as the next stage of the industry and it’s great to be involved,” he said. 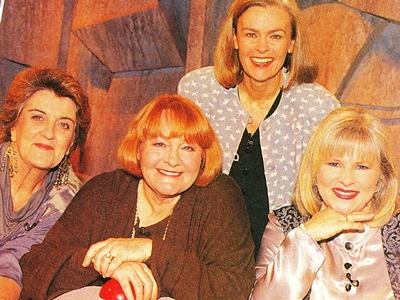 Former Fast Forward star Marg Downey is to guest star in an upcoming episode of Blue Heelers. It will be her second dramatic TV role following her starring in the telemovie Economy Class. 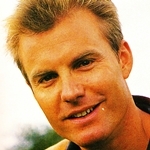 David Reyne (pictured) and Tracy Grimshaw have been announced as the new hosts for the revived Midday show, which is due to debut sometime in July. Reyne fended off opposition from Today‘s Richard Wilkins and Monte Dwyer, who both auditioned with Grimshaw. His appointment comes after the Seven Network pulled the pin on his proposed late night talk show, Electric Blanket. The return of ABC‘s youth affairs program, Wise Up with Jon Faine, was cancelled just days before it was scheduled to appear. 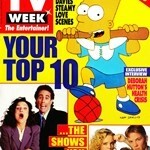 Its return had already been listed in TV guides. Even though production of the series of 10 shows has been completed, at a cost of $500,000, it is believed that ABC’s head of television, Penny Chapman, is not a fan. The cast of Heartbreak High have been on a promotional tour of Europe, where the series has been considerably more successful than here at home. It is currently screening in the UK and 12 other countries. Burke’s Backyard‘s resident builder Peter Harris has been snapped up by Nine‘s other lifestyle show, Our House. Harris was signed up by Our House after he had been approached by rival network Seven to join Talk To The Animals as well as fronting his own show. “I wanted to stay with Nine anyway, and while I was umming and aahing and rejecting other things, Our House came along and said they wanted to expand, to grow a little and add another facet to the show,” he told TV Week. Saturday: In Beyond 2000 (5.30pm, Ten), musician Mike Oldfield talks about the making of his CD ROM. The AFL season has a mid-year break while the league plays State Of Origin — Victoria versus South Australia — in a delayed telecast from the MCG (6pm, Seven). Sunday: The AFL State Of Origin (2pm, Seven) features Western Australia versus AFL Allies, live from Perth. In Banjo Paterson’s Man From Snowy River 2 (6.30pm, Nine), Kathleen (Wendy Hughes) starts a hospital for sick railway workers. Sunday night movies are Damage (Seven), Love, Honour And Obey (Nine) and Predator (repeat, Ten). Monday: In Home And Away (7pm, Seven), a plane is reported to have gone down with Angel (Melissa George), Dylan (Corey Glaister) and Teresa (Diane Craig) on board. 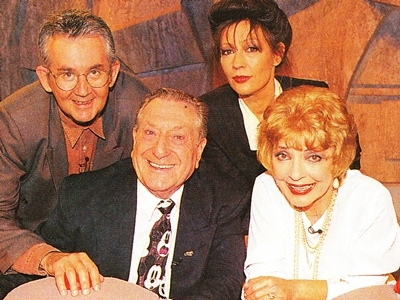 Sale Of The Century‘s (7pm, Nine) Battle Of The TV Classics kicks off tonight featuring cast members from The Sullivans. Tuesday: In Home And Away (7pm, Seven), the plane wreckage is found with one fatality; while Michael (Dennis Coard) goes off in search of two missing people. Don Lane presents a second tribute to his long-running tonight show with The Don Lane Show, Too (8.30pm, Nine). In GP (8.30pm, ABC), Sonia (Zoe Carides) and Martin (Damian Rice) are in conflict over their racial attitudes when the witness an injured footballer’s shabby treatment by his club. Wednesday: Former Prisoner cast members Maggie Kirkpatrick, Val Lehman, Fiona Spence and Colette Mann (pictured) are contestants on Sale Of The Century‘s (7pm, Nine) Battle Of The TV Classics. Thursday: In Echo Point (7pm, Ten), Frannie (Rebecca Murphy) is hurt to see Dave (Tom Long) has a girlfriend. The series return of Getaway (7.30pm, Nine) features shopping in New York, trekking from Nepal to Mount Everest and a trip of a lifetime on board the Endeavour. In Police Rescue (8.30pm, ABC), thrillseeking BASE jumpers try to enlist Mickey (Gary Sweet) and the Squad as their ground crew. Friday: In Neighbours (6.30pm, Ten), Marlene (Moya O’Sullivan) continues in her quest to find the gnome snatcher. The AFL season resumes with Friday Night Football (9.30pm, Seven), a delayed telecast of Essendon versus Hawthorn at the MCG.